Later this year, I will actually get to meet one of my idols – Cat Winters! Every other year, the library I work for hosts the Ohio River Festival of Book (ohioriverbooks.org), which is a free event that connects the public with some pretty amazing authors. In the planning stages, I had suggested Cat for the young adult audience, and you can’t even begin to imagine my excitement when this actually panned out. October 1st, I’ll actually get to meet her and see her speak, and you better believe I’m counting down the days. If you’ve never read one of Cat Winters’s books before, prepare for mass amounts of mystery mixed with heaps of history and a dash of mysticism. If In the Shadow of Blackbirds and The Cure for Dreaming are any indication of just how talented Cat Winters is, The Steep and Thorny Way is going to be the one book this year that you DO NOT want to miss! The Cure for Dreaming made such a lasting impression on me that, when asked to write a book review for the local newspaper last year, it was a clear choice what book I needed to tell the public all about. It’s a fabulous book, and one all of you should check out. Oh, and before I forget…Cat Winters currently resides in the cultural and creative epicenter of America – Portland, Oregon. Portland also happens to be home to one of the coolest book stores in the world, Powell’s, where Cat will be doing a signing on March 10th. Know what the coolest part is though? 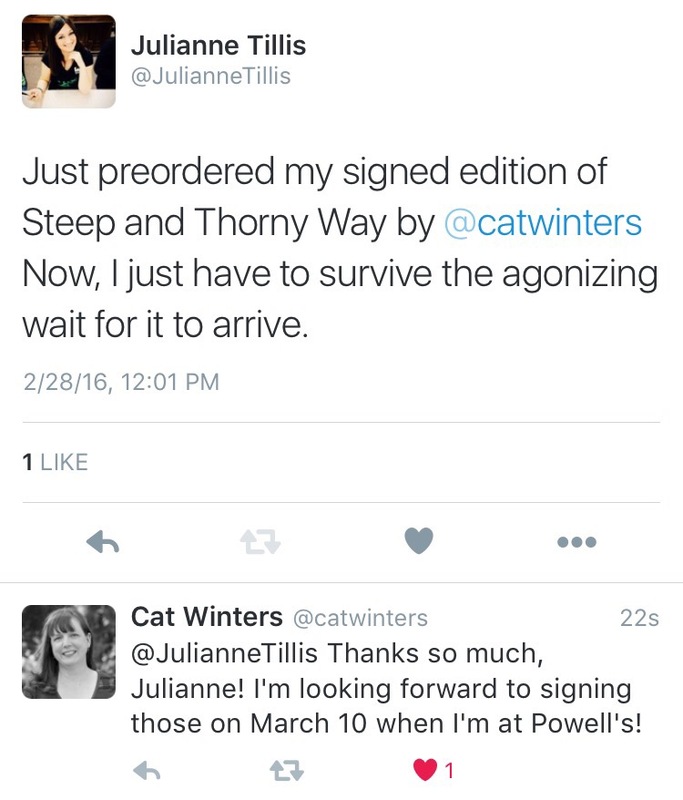 You can preorder one of her signed copies directly from Powell’s – which of course, I did. Have I mentioned she’s really receptive to talking to fans on Twitter? Cause she is. I can’t wait to meet this incredible woman! Hopefully, she’ll have a tip or two for writing YA fiction for me. This entry was posted in Waiting on Wednesday and tagged amreading, books, cat winters, ohio river festival of books, ORFOB, reading, steep and thorny way, upcoming release, waiting on wednesday, waitingonwednesday, ya, young adult. Bookmark the permalink.